FBI Director Contradicts Gonzales Testimony Four Democrats from the Senate Judiciary Committee on Thursday called for a perjury investigation against Attorney General Alberto Gonzales, then FBI Director Robert Mueller contradicted some of Gonzalez's sworn Senate testimony. Four Democrats from the Senate Judiciary Committee on Thursday called for a perjury investigation against Attorney General Alberto Gonzales, saying they believe he lied to them. Shortly after that, FBI Director Robert Mueller contradicted some of the attorney general's sworn Senate testimony. 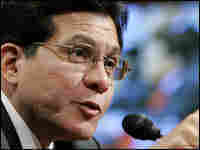 U.S. Attorney General Alberto Gonzales testifies during a hearing before the Senate Judiciary Committee on Capitol Hill on Tuesday. A four-page memo from the national intelligence director's office says that the White House briefing with eight lawmakers on March 10, 2004, was about the terror surveillance program, or TSP. The memo, dated May 17, 2006, and addressed to then-House Speaker Dennis Hastert, details "the classification of the dates, locations, and names of members of Congress who attended briefings on the Terrorist Surveillance Program." The memo appears to contradict Attorney General Gonzales' sworn statements earlier this week that the terrorist surveillance program was not the focus of the March 2004 briefing. 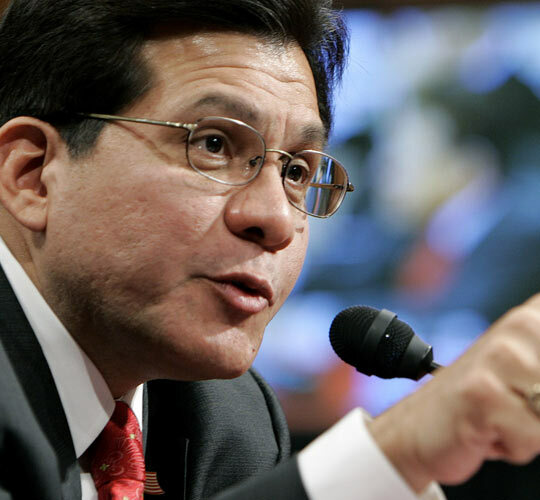 A group of Senate Democrats on Thursday called for a special counsel to investigate whether Attorney General Alberto Gonzales perjured himself in testimony regarding dissent over President Bush's domestic surveillance program. His Senate testimony on Tuesday contradicted documents concerning a 2004 meeting with key lawmakers. The documents show that, contrary to Gonzales' testimony, a terror surveillance program was discussed at the meeting. "We ask that you immediately appoint an independent special counsel from outside the Department of Justice to determine whether attorney general Gonzales may have misled Congress or perjured himself in testimony before Congress," four Democratic senators wrote in a letter Wednesday, according to a draft obtained by The Associated Press. "It has become apparent that the Attorney General has provided, at a minimum, half-truths and misleading statements" to the Judiciary Committee, they added. "We do not make this request lightly," wrote Sens. Charles E. Schumer of New York, Dianne Feinstein of California, Russ Feingold of Wisconsin and Sheldon Whitehouse of Rhode Island in a letter to Solicitor General Paul Clement. Schumer said Gonzales has abused his power and misled the American public, and that Congress cannot afford to let it go unchecked. "For months we have seen the dept. of justice unravel like a ball of string. I have seen nothing like it" in my years in office, he said. "At the helm of this Department of Justice is a man who has potentially misled the American people, again and again." A spokesman for Senate Majority Leader Harry Reid (D-CO) said Reid supports the request for a special counsel. A Gonzales spokesman earlier maintained that the attorney general stands by his testimony. At a heated Senate Judiciary Committee hearing Tuesday, Gonzales repeatedly testified that the issue at hand was not about the terrorist surveillance program, which allowed the National Security Agency to eavesdrop on suspects in the United States without receiving court approval. Instead, Gonzales said, the emergency meetings on March 10, 2004, focused on an intelligence program that he would not describe. Gonzales, who was serving as counsel to Mr. Bush in 2004, testified that the White House Situation Room briefing sought to inform congressional leaders about the pending expiration of the unidentified program and Justice Department objections to renew it. Those objections were led by then-Deputy Attorney General Jim Comey, who questioned the program's legality. "The dissent related to other intelligence activities," Gonzales testified at Tuesday's hearing. "The dissent was not about the terrorist surveillance program." "Not the TSP?" responded Schumer. "Come on. If you say it's about other, that implies not. Now say it or not." "It was not," Gonzales answered. "It was about other intelligence activities." A four-page memo from the national intelligence director's office says the White House briefing with the eight lawmakers on March 10, 2004, was about the terror surveillance program, or TSP. The memo, dated May 17, 2006, and addressed to then-House Speaker Dennis Hastert, details "the classification of the dates, locations, and names of members of Congress who attended briefings on the Terrorist Surveillance Program," wrote then-Director of National Intelligence John Negroponte. It shows that the briefing in March 2004 was attended by the Republican and Democratic House and Senate leaders and leading members of both chambers' intelligence committees, as Gonzales testified. Schumer called the memo evidence that Gonzales was not truthful in his testimony. "It seemed clear to just about everyone on the committee that the attorney general was deceiving us when he said the dissent was about other intelligence activities and this memo is even more evidence that helps confirm our suspicions," Schumer said. Bush acknowledged the existence of the classified surveillance program in December 2005 after it was revealed by The New York Times. In January, it was put under the authority of the Foreign Intelligence Surveillance Court for judicial review before any wiretaps were to be approved. The broadcast version of this story misidentified a member of Congress. We said it was Stephen Cohen, Democrat of Tennessee; we should have said it was Artur Davis, Democrat of Alabama.